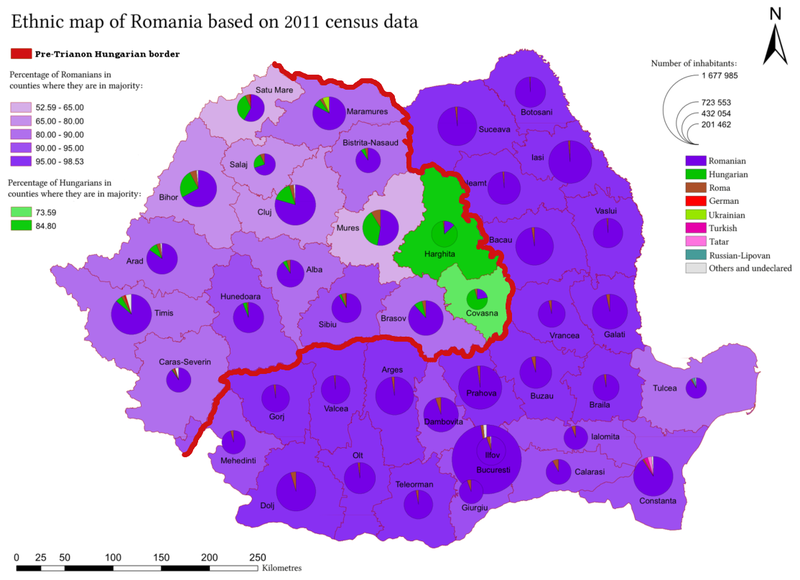 According to the 2011 census, the population of Romania was 20,121,641, of which 6.1% were ethnic Hungarians. The majority of the Hungarians in Romania live in areas that were part of Hungary prior to the 1920 Treaty of Trianon. The most prominent of these areas is Székely Land (Szeklerland, Tinutul Secuicesc or Székelyföld), which is in a region known as Transylvania. Of the forty-one counties of Romania, Hungarians form a significant population in the counties of Harghita (85.21%), Covasna (73.74%), and Mures (38.09%). Other counties with a notable Hungarian population include Satu Mare (34.65%), Bihor (25.27%), Sălaj (23.35%), and Cluj (15.93%). The major representative of Hungarians in Romania, an organization known as the Democratic Union of Hungarians in Romania (UDMR), seeks to achieve self-government as well as cultural and territorial autonomy for the Hungarian minority. These goals mean guaranteeing the right of democratically elected officials in Hungarian communities to decide local affairs, preserve the use of the Hungarian language, maintain educational institutions, and promote Hungarian cultural activities. Although Romania co-signed the European laws protecting such minority rights, their implementation has been lacking and of little proven benefit to the broader Hungarian community. In fact, the Hungarian community in Transylvania continues to experience systematic discrimination by Romanian authorities, including illegal arrests, closure of Hungarian institutions that include schools, and prevention of Hungarian cultural activities. This deliberate discrimination also involves illegal actions carried out by Romanian citizens, such as vandalism of assorted Hungarian properties including buildings, homes, and cemeteries. The latest example of Romanian discrimination against the Hungarian population of Transylvania involves a Romanian plan to close a Hungarian Roman Catholic high school. To express their opposition to this plan, on September 5, 2017, thousands gathered in the Transylvanian city of Targu Mures,formerly known as Marosvásárhely, to peacefully register their protest. 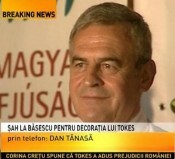 Due to Romania’s Roman Catholics being predominately ethnic Hungarians, the planned closure of the school was viewed by the protesters as both an ethnic and religious-based assault on their legitimate minority rights. The Romanian government attempted to rationalize the projected closure by alleging that the school lacked proper documentation and claimed this was the reason for launching an administrative proceeding last year against the school’s principal and the school itself. The protest in Targu Mures was organized by the Roman Catholic Status Foundation and included prominent religious leaders. Participants included György Jakubinyi, Archbishop of Alba lulia; Béla Kató, Reformed Bishop of Transylvania; and Barna Kapás, head of the Status Foundation. Earlier, on June 26, 2017, Balázs Izsák, President of the Székely National Council, filed an appeal in a case against the Anti-Discrimination Council whose members include former President Traian Băsescu, former Prime Minister Victor-Viorel Ponta, Romanian politician George Crin Laurențiu Antonescu, and engineer Liviu Nicolae Dragnea. The Anti-Discrimination Council, otherwise known as the National Council for Combating Discrimination, was established in 2001, and is responsible for upholding Romanian and European Union anti-discrimination laws. The lawsuit, filed on May 2017, in the Bucharest Court of Appeals (Curtea de Apel), maintained that so-called reforms advanced by Romanian authorities discriminate against the Hungarian minority by eliminating every administrative unit that currently has a Hungarian majority in violation of EU Directive 2000/43, which calls for the equal treatment of persons irrespective of racial or ethnic origin. The lower court promptly rejected the President of the Székely National Council’s claim, resulting in the pending appeal. Founded over 100 years ago, the American Hungarian Federation (“AHF”) has for decades promoted human and minority rights, including the rights of Hungarians living in the countries neighboring Hungary. AHF's International Relations Committee is proud to announce, consistent with and in furtherance of its continuing and long-standing tradition and mission, a new initiative -- Transylvania Today -- a quarterly, brief update relating to the Hungarian minority in Transylvania. 1/15/2014 - In 2009, PBS Television presented a documentary film on the planned open pit cyanide gold mine at Verespatak in Transylvania, now called Rosia Montana. In 2014, the Unitarian Church of Transylvania produced this English-language video entitled "Life over Gold - a Unitarian stand for Roşia Montană." [read more] and view both videos. 1/12/10 -- The American Hungarian Federation urged Vice President Biden to discuss policies with his "Romanian interlocutors that they should adopt to strengthen Romania's democratic institutions and respect the rights of its Hungarian minority" during his trip to Romania. Frank Koszorus, Jr., co-president and chairman of the Federation's International Relations Committee reports, "We understand that issues relating to the Hungarian minority were raised." [Read more] The letter to the Vice President included a statement on AHF's concerns for the Hungarian minority in Transylvania.